Len Rutledge is one of Australia’s most respected travel writers. His articles and books have appeared worldwide and his background and experience in the travel and tourism industry is unsurpassed. Luxury travel, budget travel, adventure travel, individual and group travel he has done it all. 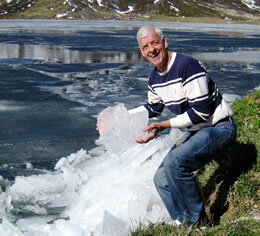 As a travel writer, Len has spent 40 years travelling the world and visiting 100 countries. In between he has started his own newspaper, been both a newspaper and a travel guidebook editor, spent years as travel editor for the Manila Times and Townsville Daily Bulletin, written thousands of articles for newspapers, magazines and websites, been correspondent for several travel and hospitality trade publications, and written over 45 travel guidebooks and travel publications. His insights into the tourism industry have been sharpened by experience in the industry as a director of The Travel Company (travel agencies), Australian Explorer Tours (tour and coach operator), an inbound tour operation, and Reef Wonderland (tourism attraction). Len has a PhD in Tourism, and additional qualifications in engineering, economics and regional planning. While he is based in North Queensland, Australia, Len has lived in the United Kingdom, the USA, Thailand, the Philippines, Mongolia, Croatia, Palau, Cambodia and Laos. This has given him a great understanding of different cultures and this clearly shows in his work. This has been further enhanced by consultant assignments for the United Nations, the World Bank, the Asian Development Bank, the Tourism Authority of Thailand, the Philippines Ministry of Tourism, and the Australian and Swedish governments. Along the way Len has been awarded honorary membership of the Australian Society of Travel Writers (2000), a PATA Gold Award for travel writing (1988), an ASEANTA Southeast Asia Writing award (2010), IgoUgo Hall of Fame (2003) and a finalist in Travelocity International Travel Writer of the Year (2009). Time has not diminished Len’s enthusiasm for travel or writing. He now only works on assignment and has recently produced stories on Ireland, Norway, Thailand, Egypt, Greece, Jordan, Romania, Peru, Palau, Bolivia, Chile, Argentina, Uruguay as well as on destinations within Australia. Editors value his ability to produce evocative, highly targeted stories and photographs and to always meet deadlines. Tourism organizations and tourism companies appreciate the opportunity to have their product across newspapers, magazines and the web in professional, believable stories.